With 2016 drawing to close and 2017 right around the corner, it’s a good time to reflect on the progress we have made with JPDF2HTML5 in the past year and to discuss our plans and ideas for 2017. Despite many people wanting to write off 2016 and forget that it ever happened, 2016 has been a very successful year for JPDF2HTML5. We see more sales inquiries than ever, the number of companies using JPDF2HTML5 is steadily increasing, and customer satisfaction is at an all time high. We can attribute our success to a number of things, the most important of which is that JPDF2HTML5 continues to get better. Files are faster to convert, faster to render in the browser, the display is more accurate, additional PDF features are now supported, and the IDRViewer has seen a major update which allows you to completely customize the user interface in order to match existing systems. Our monthly release has allowed us to interate quickly and our customers appreciate the prompt updates on the issues they report. We have a number of ideas and would like to hear your feedback so that we can understand what’s important for you. Some of the ideas are more serious than others and there may be one or two that we have no intention of pursuing but would like to gauge interest. Our ideas involve not only improving support for existing annotations, but also extending the IDRViewer to offer annotation creation and removal, including exporting and importing and more. It’s possible to use JPDF2HTML5 alongside tools such as LibreOffice to allow display of office documents as HTML5, but we may explore adding native support for office file formats. Many of the companies we speak to are running on platforms besides Java and would like an easy way to access the functionality that JPDF2HTML5 provides. Users of our online converter absolutely love the quality of conversion we provide and regularly ask about a way to run JPDF2HTML5 on their local systems. Many industries rely on 3D documents and are currently missing out on a solution that works in the browser on any device. Another commonly requested feature that many of our publishing clients ask us about. Many documents are not well suited to display on mobile. Adding document reflow would allow comfortable reading of all documents on any device. So there is our list of ideas for 2017. If you are an existing customer, what additional features would you like to see? 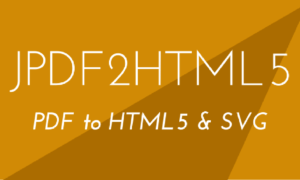 And if you do not currently use JPDF2HTML5, what would pursuade you to start using it? Feel free to let us know privately or via the comments below.